On Nov. 16 at MHS, senior Taylor Swartz signed her National Letter of Intent to join the West Virginia Wesleyan softball team. Sitting in the front row, from left, are Dee Swartz, Taylor Swartz and Toby Swartz. Standing in the back row are MHS athletic director Kevin Musser and Lady Marauders head coach Bryan Swann. ROCKSPRINGS, Ohio — Talk about a steal. 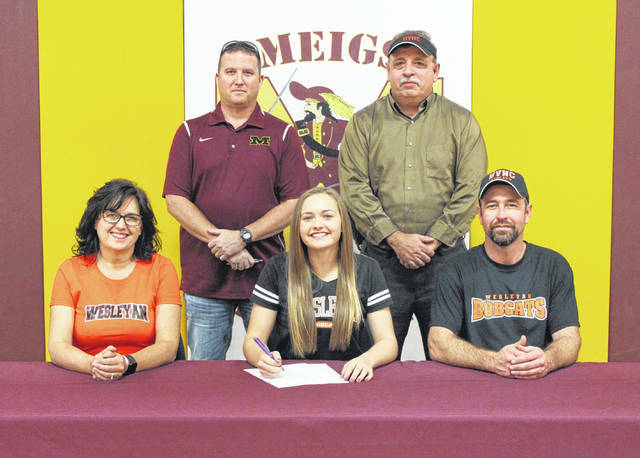 The West Virginia Wesleyan softball team picked up a new master thief on the base paths, as Meigs senior Taylor Swartz signed her National Letter of Intent to join the Bobcats on Friday inside Meigs High School’s Larry R. Morrison Gymnasium. Swartz — who has a three-year varsity total of 47 stolen bases in 49 chances — talked about why Division II West Virginia Wesleyan was the right fit for her. With her senior campaign still to come, Swartz has 41 extra-base hits in her prep career. A starting center fielder since her freshman year, Taylor’s career-high stolen base total of 26 came with career-best .557 on-base percentage as a junior. Also in her junior year, Taylor had a perfect fielding percentage in 33 chances. As a sophomore, Swartz batted .526 with runners in scoring position. 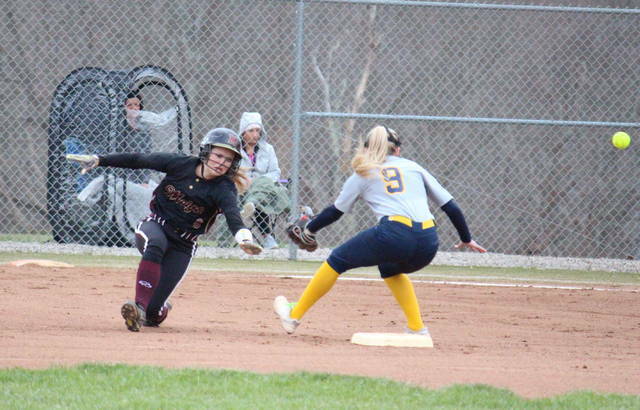 MHS head coach Bryan Swann — who has guided the Maroon and Gold to 52 wins in three years with Swartz on the team — talked about the impact he expects his star leadoff hitter to have on the Mountain East Conference team. “I believe she’s a D-1 athlete, I’ve told coaches that all along, but sometimes a college is just the right fit for a kid,” Swann said. “I think she found a place that’s a good fit for her, I know she’ll do well there. With us, she came in as a freshman and played center field, and I haven’t looked out an seen anybody like that ever. Every single year, if she’s not the top hitter on the team, she’s near the top. Swartz — a two-time all-league honoree — was all-district first team selection as junior, after being on the second team as a sophomore. All of Taylor’s softball success came in the same season that she was excelling for the MHS track and field team. A multi-time, multi-event regional qualifier, Swartz was a part of the Lady Marauders 2017 4x100m relay team that was eighth in the state. Swartz acknowledged her goals once she gets to Buckhannon are primarily in the classroom, but that she’s also looking for an all-around college experience. Swartz — who has also competed on the varsity basketball and cross country teams at Meigs — holds a 3.961 GPA, currently placing her 12th in MHS Class of 2019. At Wesleyan, Taylor plans to major in Early Childhood Education, and hopes to become a first grade teacher.